This past weekend the final two segments of 46 were installed on the Macdonald Bridge marking a major milestone in the Big Lift project. Read more about the Big Lift below. 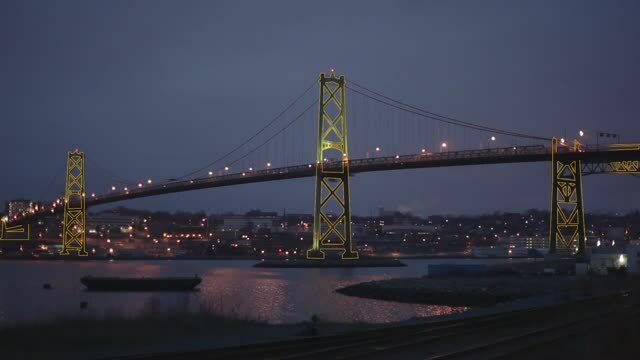 Halifax Harbour Bridges is embarking on a significant and necessary project beginning in early 2015: the replacement of the suspended spans of Macdonald Bridge. The bridge remains safe, but after 60 years the deck is wearing out and needs to be replaced. The project, also known as The Big Lift, aims to extend the life of the bridge and reduce maintenance. 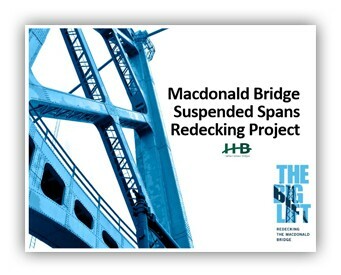 The Big Lift includes: replacing the road deck, floor beams, stiffening trusses and suspender ropes on the suspended spans of the Macdonald Bridge. When The Big Lift is complete, a significant amount of the bridge infrastructure will be new. The bridge will be open to vehicular traffic during the day. The work will be done mostly with overnight and several weekend bridge closures over the 18-month period. This is only the second time that the suspended spans of a suspension bridge will be replaced while keeping the bridge open to traffic. The first time was on the Lions Gate Bridge about a decade ago. The Lions Gate Bridge is the sister bridge to the Macdonald Bridge, also designed by P.L. Pratley. HHB is working with the same bridge engineering firm, Buckland and Taylor, as was used on the Lions Gate redecking project. Some may think the suspended spans were replaced when the third lane was added in the late 1990’s but that is not the case. To create the third lane, the deck was kept and five feet of road deck was added on each side where the old sidewalk and ductway were. The bike lane and sidewalk were added to the outside of the bridge. At the same time the deck of the approach spans were replaced, but not the suspended spans. Once the 46 deck segments are replaced, the shipping clearance will be raised by approximately 2.1 metres. The hangers on the bridge will be replaced and at that time the bridge will be raised in increments (HHB is checking this with the engineers). While large post-Panamax are able to successfully navigate the bridges currently, the opportunity to raise the height as part of the overall redecking project is part of a prudent long-term planning strategy to ensure Halifax Harbour and Bedford Basin continue to accommodate a wide range of vessels.